Two powerful tales by one of our most exciting and acclaimed writers of the fantastic. Paperback 125mm x 195mm, 108 pages. 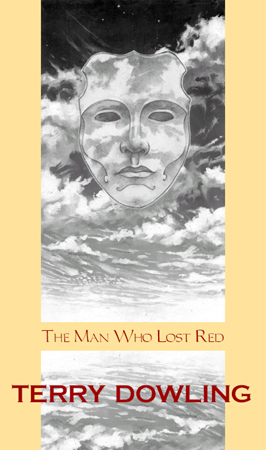 MirrorDanse Books was proud to publish Terry Dowling's Ditmar award-winning novella, 'The Man Who Lost Red', previously only available in Aphelion Magazine, Autumn 1986, as a book. The Man Who Lost Red also saw the first publication of the novelette, 'Scaring the Train', subsequently reprinted in both Ellen Datlow & Terri Windling's, and Stephen Jones & Ramsey Campbell's Year's Best anthologies. The book also featured a bibliography correct until the time of publication, and an introduction by Nick Stathopoulos. Cover art and four interior illustrations were provided by World-Fantasy Award winning artist Shaun Tan. The Man who Lost Red was limited to 500 copies and quickly went out of print. Now, in 2003, MirrorDanse has reprinted The Man Who Lost Red. The contents remain the same, with the exception that the bibliography has been updated to include all of Terry's fiction through to March 2003. Most criminals punished by the seven masked aliens who rule the Earth must accept their fate and get on with their lives. Yet Eric Andlan needs more. What was his crime? Who or what are the iquiri overlords? More importantly, why are they here? Andlan desperately needs to know. Available again at last, this Ditmar Award-winning tale is First Contact with a difference! Just a harmless holiday prank. What could go wrong? But while they are frightening train drivers, two boys are plunged into the heart of an absolute nightmare which will last long into their adult lives.